"I don't have a plan. I wish I could have a gym-like program for my voice." "I want to train my voice, but I really don't know what to do. I only end up singing songs." "Even with a weekly music lesson, I still get stuck in my daily practice." "Online voice coaches have conflicting methods. It's very confusing." "I can't afford music lessons." Transform Your Voice. Stop dreaming. Live your dream. Learn to Warm Up Properly, Correct Posture, Breathe Effectively, Develop Resonance, Know your Vocal Anatomy, Master your Onsets, Deal with Nasality so Much More. Build on the Fundamentals and Understand Registers, Increase your Range, Fine Tune your Articulation, and Increase your Vocal Agility. Seriously, so much more than we can mention! Go All Out and Develop your Ear, Discover your Signature Sound, Learn how to Sing in Different Genres and Styles, Tweak your Vocal Settings, and Belt Like a Pro. Rich Texts and Sketches (Information). "It's lessons are not worth of 1000€.They are worth of billion of €.Thanks for transforming my voice." "I've been searching intensively for online courses to learn how to sing and I really didn't find any that provide systematic approach for developing the voice. This app is just priceless"
I really like the lessons! Some of them are still a bit difficult for me, but I see myself that my singing has been improved a lot! Very good!!! User-friendly, intuitive with incredible content! This is the best music education system that I have come across in my 12 years as a music educator. Keep rocking, developers! Highly recommended! You are a download away from transforming your singing! Absolutely Brilliant! Firstly, a teaching video for instruction. Secondly, text and sketch documents for information. Thirdly, audio exercises set to music for application. Finally, manuscripts to accompany the exercise tracks. Voxtrainers watch these training clips more than 1,5 million times every month, and this number only grows. Mandy studied Jazz and Contemporary Music at Tshwane University and taught at the National School of the Arts in Johannesburg. She also has a Level 7 Certificate with the Voice Workshop in the UK, and is currently working towards further vocal studies. Her professional singing career includes solo, a cappella, vocal ensembles, shows, cabarets, choir and band work in multiple genres. Access your Voxtrain course on any device. Dedicated Voxtrain Apps coming very soon. As part of the learning material, vivid sketches reveal the anatomy of your incredible voice and body. Why should only guitarists know their instruments? Very often, a simple explanation of the larynx or diaphragm leads to a massive "aha" moment and correct a problem. This course is designed to remove all excuses and make you a better singer. Day by day. Step by step. Easy to follow. Here is a tiny sample of your Voxtrain demo audio exercises. These exercises make a whole lot of sense inside the training program as each exercise is designed to achieve a specific result. More than $2050 worth in singing lessons. Day-by-day training program. No guessing. Only $2.42 per music lesson for 18 week bundle! 82 training videos, 100's of audio exercises with manuscripts. 26 Anatomical sketches. Available on any screen, anytime, anywhere. Yes, a 14 day Money Back Guarantee! Voxtrain has been designed, delivered, tweaked, redesigned, relaunched and consistently upgraded since July 2013. Surveys, artist interviews, user feedback, requests, and lots of work went into this current version. We are so confident that it will develop your singing, that we provide this money back guarantee. No questions asked. We only want happy students. 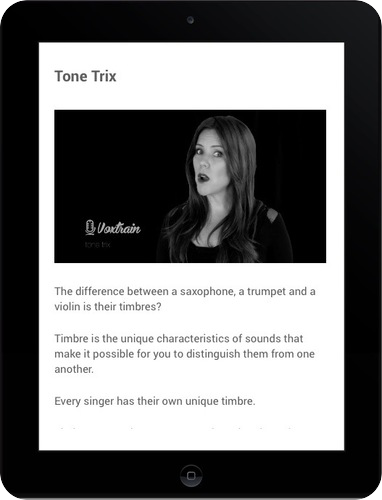 Voice lessons in your pocket. Voxtrain is a voice training program for those who want to learn to sing at home. So many singers want to sing better, increase their vocal range, and develop their own signature sound. Voxtrain was designed to help singers overcome all excuses and all obstacles by providing a day-by-day system that covers everything they need to become a better singer. The course content was developed by singers and voice coaches. The exercises were composed in recording studios to keep students inspired and engaged. 26,5% of our singing community work all the way through the program, which is phenomenal, and proves how much value they get from these singing courses. Since Voxtrain was built by musicians for musicians, a lot of passion and effort went into explaining the inner workings of the actual voice from a scientific perspective. This was done because there are so many fads, diva’s, and branded methodologies out there that it is confusing. Our voice coaches studied hundreds of books and academic articles so you wouldn’t have to. Rich content and hundreds of powerful exercises were combined to put a simple program in your hands, so you can take your singing to the next level. Our courses are aimed at people older than 15 years. Beginners who might not know music theory, but still love singing. Singing students who need a daily tool to help them train. Choir members who are looking for voice training and warmup tools between choir practices. Professional singers. Yes, we have some professional singers who use Voxtrain to stay in shape and increase their flexibility. Our set of proper warming up techniques help them to take care of the voice, so they can keep up with the high demand placed on their voices with touring. $199 for 3 Voxtrain courses bundled together as a total program. Altogether 18 weeks of content. Voxtrain costs $1.58 per day and once the lesson is over, it's yours to repeat as many times as you want. Is Voxtrain available as iOS and Android Apps? This means that you can download the Worldclass.io app, and your Voxtrain courses are available on iOS, Android, and Web. Whenever. Wherever. I used to have the free iOS app. Is it not free anymore? Unfortunately the original iOS Voxtrain app has been discontinued. We shipped 9 million lessons in the first three months of 2018 and it became too costly to maintain as a free offering. Some interesting facts about our current Voxtrain users. From Voxtrain's first 100'000 users, we have had complete novices as well as professional artists using Voxtrain. Our biggest demographic is 30-39, second biggest is 13-19, and third biggest group is 20-29. Voxtrain is presented in English, and so our top 10 ranking cities are New York, London, Los Angeles, Chicago, Johannesburg, Toronto, Berlin, Atlanta, Sydney, and Vancouver. Except for Iceland, there are Voxtrainers in more than 160 countries! Come on Iceland! Does Voxtrain replace my singing teacher? An online course could never replace a teacher. However, so many people worldwide are part of a self-learning revolution, and so many more cannot afford music lessons. Voxtrain tried to bridge the gap between a tool for voice coaches to help them work through a structured course with their students, and a music lesson alternative for the passionate singer who doesn't have access to music lessons. Since Voxtrain is not trying to brand a methodology, and is based on scientific research, our exercises and content can be used in conjunction with a private voice coach. Think of it as a gym full of equipment for your voice. Voxtrain offers a gym and a training program. If you had a voice coach, it means you have a dedicated trainer as well. I m a classical vocalist and I was in search of such app where u can practice in correct manner. Sometimes we don't aware about our wrong notes , here on this app our notes and pitch will be perfectly ok , secondly breathing is very important and this app has taken care of that also. It really improved my singing I am a actress and one of those things in acting is singing and it really really improved my singing and when I was done with the 6 weeks I discovered that my new talent is singing. voxtrain you are the BEST!!!!!!! I am new at voice training and found this app quite helpful along with my lessons from my instructor. I can do this on my own or use the warm up exercises before my lessons. Once you have completed the weekly sessions you are able to go back and practice some more. Is there a mic? No monthly costs. Purchase Voxtrain once-off.